Recruitment specialists in neurology say the demand for the specialty has been growing and there are plenty of jobs available. But practices in some areas of the country are having difficulty recruiting for open positions as clinicians entering the market seek greater flexibility in scheduling and a preference for more urban, populated areas. If you are a neurologist looking for a new job, there is some great news for you. According to an October 2018 analysis, neurology was identified as the “most-in-demand” specialty by PracticeLink, an online physician recruitment resource that analyzed their database to see which specialties have the most jobs posted overall. In order to create its physician recruitment index, the site then ranked those in-demand specialties according to the supply. Topping the list was neurology, which had the most jobs available and the fewest candidates per job. According to experts, the primary factors driving demand are population growth and an increase in older Americans. A 2013 report in the journal Neurology concluded that the demand for neurologists was projected to increase from 18,180 in 2012 (an 11 percent shortfall) to 21,440 by 2025 (a 19 percent shortfall). Since neurologic disorders disproportionately affect older adults, the demand for neurologists is expected to intensify over time. Neurology Today spoke to several recruitment specialists in order to better understand the market. Travis Singleton, executive vice president at Merritt Hawkins, the largest physician recruitment firm in the United States, advised that the best way to look at supply and demand is to examine the number of jobs in relationship to size of specialty for the so-called “absolute demand.” According to Merritt Hawkins data, neurology is the now the fifth most requested specialty at the firm as of the last 12 months, having risen from ninth place in the previous year. That desirability also translates to better compensation. In general, when a shortage is anticipated, doctors' salaries tend to rise. Singleton has seen the average compensation, including guarantees and sign-on bonuses for a neurologist rise more than $40,000 over the past four years, including a $30,000 rise over the past two years alone, and a projected rise of another $15,000. “To a health care system, a neurologist is valued at approximately $1,000,000 in net inpatient and outpatient revenue,” Singleton said. As a result, he added, hospitals and health care systems are telling him that they are paying neurologists more than ever before. Merritt Hawkins figures show a 14 percent turnover in neurology, which is one of the highest of all specialties. Indeed, the 2017 Profile of Older Americans by the Administration for Community Living, which primarily uses US Census Bureau data, reveals an increasingly older population that is destined to live longer than previous generations. By 2040, there will be about 82.3 million older persons, more than twice their number in 2000. People aged 65 and older represented 15.2 percent of the population in the year 2016 but their numbers are expected to grow to be 21.7 percent of the population by 2040. The 85-and-older population is projected to more than double from 6.4 million in 2016 to 14.6 million in 2040 (a 129 percent increase). Singleton also has concerns about the type of neurologists becoming less available as the demand spikes and the shift in expectations among the new generation of specialists . More general neurologists are retiring, he said, while at the same time, newly minted fellows only want to practice in their subspecialty field. “As they go to practice in large multispecialty groups or at academic centers, they want to see about 10-12 patients a day and the need is closer to 18-20,” he noted. “We also find that they want to do either in-patient neurology or out-patient neurology, not a mix, and many are seeking positions with shift work seven days on/seven days off or 14 days on/14 days off,” he said. That doesn't match the needs of recruiting organizations, especially in the smaller or rural markets, where they need general neurologists. “Those positions are getting increasingly harder to fill,” Singleton said. According to a 2018 Merritt Hawkins white paper “Neurology Recruiting and Compensation Trends in an Era of Physician Shortages,” the Association for Staff Physician Recruiters' recruitment benchmarking survey reported that open neurology positions are the least likely to be filled, particularly for health care organizations located in communities with a population of 10,000 or less. One such community is in Reading, PA, which has an estimated population of 88,423 according to the most recent United States census estimates. Karen A. Hoerst, MD, a member of Reading Hospital Tower Health Medical Group, a hospital-based neurology practice, is the only practicing vascular neurologist and only employed physician on the stroke service. Her group has been actively recruiting for another vascular neurologist since 2015. She also pointed out that while the neurology practice is part of a large center with excellent patient care and quality metrics, they don't have the name associated with a large academic institution. This may change, she acknowledged, as a collaborative medical school is being formed with Drexel University College of Medicine. Recruitment industry specialists concur that there is a shortage of neurologist candidates. “The overall average length of time to fill a neurology position is six to eight months but there are some subspecialties, such as pediatric neurology, that are taking much longer, on the order of 18-20 months,” said Beth Dery, recruiting and operations manager at Rosman search, a targeted neurosciences recruiting company and the largest vendor partner of the AAN Career Center. Dery, who had done an online search of open positions in June, found more than 300 open neurologist positions. “We've been having trouble filling positions in neurology, and many of us recruiters have been struggling with that for quite a while,” said Wanda Parker, president of the National Association of Physician Recruiters (NAPR) and a principal with the Healthfield Alliance in Danbury, CT. She believes that primary care practices are better able to deal with some of the shortage by hiring advanced practice providers, but that in neurology that option is much more limited. Models where physicians and multiple advanced practice clinicians work as a team are advantageous, but that approach better suits more urban areas, she said. “With less than five neurologists per 100,000 population, the neurology needs are growing. Certainly, advanced practice clinicians will play a greater role and will fill gaps created by organizations' inability to recruit neurologists, but nothing beats recruiting a neurologist to your own community,” she concluded. Looking for a Neurologist? Tough Times Call for Creative Solutions. Kane Hall Barry, a neurology practice with five neurologists and four other clinicians had been working with traditional placement firms — which usually took six months to fill an opening — when its practice manager, Jennifer Hagen, decided to try her own hand in placing advertisements on conventional websites like Indeed. She was amazed at the response she got. “I have more candidates looking for placement in the Dallas-Fort Worth area for the summer of 2019 than I have ever seen before, and I had to turn away candidates this year,” she said. “By not going through a search firm, it allowed me to pay candidates more in salary since I was not spending the money for someone else to do the work for me,” she said. Barry explained that her practice is trying to think outside of the box to help young doctors to see their future as a business owner instead of the immediate short-term financial gain. “As time wears on, practices are going to have to get creative with recruiting,” she advised. •. Dall TM, Storm MV, Chakrabarti R, et al Supply and demand analysis of the cucerrent and future US neurology workforce http://n.neurology.org/content/81/5/470.long. Neurology 2013; 81(5):470–478. 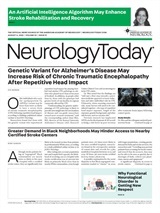 Neurology Today19(3):1,48-49, February 7, 2019.